The Diswasher Thermometer displays the maximum temperature reached in the dishwasher. The thermometer is of course waterproof to IP66. 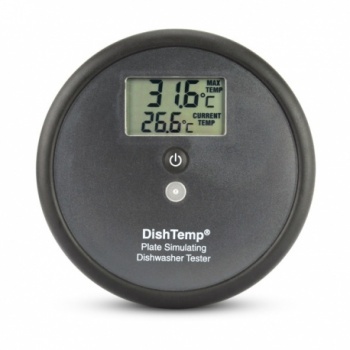 The DishTemp® Dishwasher Thermometer accurately records the maximum surface temperature by pressing a button. The DishTemp® thermometer is re-usable and replaces the requirement for for costly and inaccurate test strips and is safer to use then stem type thermometers with probes which tend not to stay in place during the cleaning process and fails to record temperature at the plate surface. Desgined to survive the daily use within a professional kitchen, the DishTemp® Dishwasher thermometer has a temperature range of 0 to 90 °C with a resolution of 0.1 °C/°F and an accuracy of ±0.5 °C.